Partnering with a Microsoft Certified Partner in close proximity to your NYC-based organization offers numerous advantages. Find out how our Microsoft Excel Consulting Experts can help you to run your business the way that you want to. * As seen on the Microsoft.Com website, and as seen embedded in Microsoft Excel (Excel Templates). With the advent of the Internet, it’s easier than ever to connect with anyone, including and even those thousands of miles away. This capability has dramatically changed the way people work. According to the Bureau of Labor Statistics, “the share of workers doing some or all of their work at home grew from 19 percent in 2003 to 24 percent in 2015,” and these numbers will undoubtedly continue to rise. Working from afar is even more popular in highly technical fields. In a world transformed by telecommuting, when you need a sophisticated software solution, it may seem like a remote Microsoft Certified Excel and Access consultant is your most optimal solution. Call us today for a free consultation and to find out how we can assist you with all of your Microsoft Solution needs, 877-392-3539. However, despite the seeming convenience of this choice, there are times where your unique situation means you would be better served by a local programming professional, particularly in a bustling city like the Big Apple. The Excel Consultant team of Microsoft Excel, Access and Power BI experts works with a wide variety of clients in this metropolis, from major retailers like Ralph Lauren to neighborhood institutions like the New York Police Department. To even better serve enterprises in the Empire City, we recently expanded our Manhattan New York office, allowing us to assist companies, colleges, government agencies and non-profits in person. In the following blog, we explain why Manhattan businesses should work with our team of local Microsoft Excel and Access experts, consultants, programmers and trainers. Millions of people live in Manhattan and hundreds of thousands of businesses call this city their home. Real estate alone on the island is worth over a trillion dollars, according to a recent report from CNBC. Crowded cafes, the buzz of Wall Street, high-end fashion boutiques, and myriad universities are just a few of the diverse industries booming here. In this fast-paced, competitive environment, every enterprise needs all the computerized help it can get. Of course, the Microsoft desktop productivity applications are the mainstay of modern businesses. 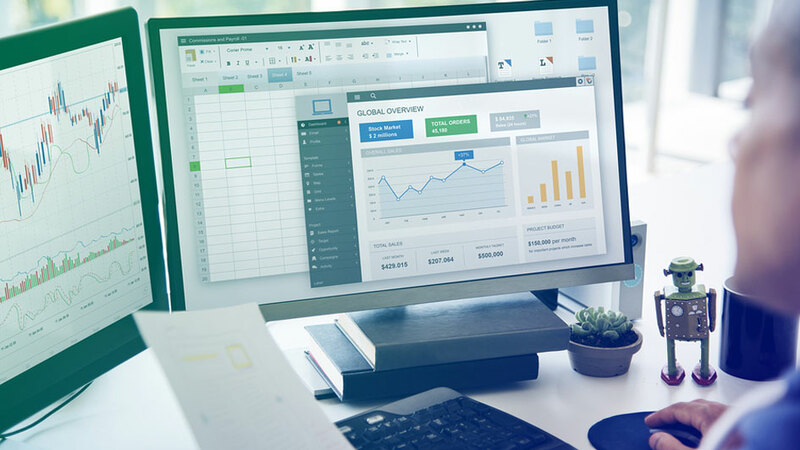 Microsoft Excel worksheets, Microsoft Access databases, Microsoft Power BI Dashboards, Word, Powerpoint, and the rest of the Office Suites (Windows and Mac) are indispensable for running a company in the twenty-first century. The vast majority of companies, colleges, government entities and non-profits use these on a daily basis. 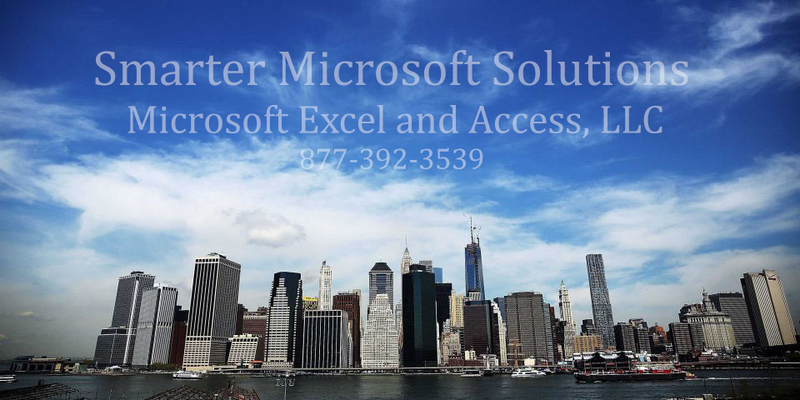 The Excel Consultant team of Excel and Access experts can help you make the most of them with advanced advice, innovative instruction, and state-of-the-art Microsoft Solution development so that your Manhattan venture can prosper. More in-depth onsite consultations. Ultimately, phone calls, emails, and video-conferencing tools are not as effective as a face-to-face meeting. Our local Manhattan expert programmers can sit down with you and your team to get to know your company, government office, colleges and non-profit to find out exactly what you need, provide detailed demonstrations, and offer our exhaustive advice. Amidst hundreds of generic video call presentations, droning phone calls, and repetitive emails, our personalized, in-person advice stands out. Superior, in-person training. One of the main services our team of Excel Consultants offers is Onsite Microsoft Excel, Access, Office training. We offer micro-group workshops, classes, one-on-one instruction, seminars, an our Microsoft Excel Academy, and more. While we can certainly educate you on Excel, Access and Office remotely with our webinars and training videos, we’ve found that most clients learn best from close, personal tutelage. Working directly with you allows us to more immediately answer your questions and show you the details of your Microsoft Office software. With our local consultancy at your disposal, you can come to our beautiful office to learn, or, as most clients prefer, we can come to you. Training you in the comfort of your workplace means we less travel for your team. A better understanding of the local market. How could one of our UK programmers, let’s take Ian for example, consultants and trainers in London possibly appreciate the more particular aspects of your Upper East Side clientele? Top local consultants like ours consistently work with hundreds of Manhattan businesses, government offices, colleges or non-profits. We comprehend the unique dynamics and demographics that drive this market. When you work with us, you’ll have to spend less time explaining your business model, giving you more time to enhance it with Microsoft’s desktop productivity and database software. Simpler tech support. You’ve probably experienced the extreme exasperation of attempting to get help with your computer remotely. “Have you tried turning it on and off again?” “Click the red ‘X’ on your right…no, above the taskbar…yes, to the right.” “Yes, clicking that key should allow you to open a new spreadsheet…” You can solve your computerized conundrums a lot faster by employing a local consultant who can physically come by your office. Being able to see and interact with you and your software in person makes tech support exponentially easier for all involved. More advanced, comprehensive software development. The Excel Consultant team specializes in providing truly affordable, customized, cutting-edge Microsoft solutions, let’s call them Smarter Microsoft Solutions, for your business. We often work closely alongside you to streamline your workflows. Understanding the way your business operates in person helps us optimize it. Furthermore, programming on your premises allows us to instantly catch any glitches and make adjustments to enhance your system. For these reasons, Excel Consultant regularly sends at least two and up to five professionals onsite during development. For these reasons and many more, Excel Consultant encourages all New York City clients to work with a local consultancy like ours. When selecting a team of local software specialists to help you maximize your Microsoft capabilities, we strongly suggest considering ours. The expanded Excel Consultant Manhattan office is centrally located in the financial district at 42 Broadway, New York, NY, 10004. Our highly advanced team is composed of numerous Microsoft MVPs and partnered with a Microsoft Certified Partner. This means our experts have earned some of the highest accolades possible in the Microsoft world. In addition, some of our longest tenured, most skilled consultants work out of our beautiful Empire City location. For example, Senior Access Developer, Helen Feddema, frequents this office. Throughout her prestigious, decades-long career, Helen has earned dozens of awards and even authored a multitude of books on Microsoft software. The rest of our New York City-based team is commensurately credentialed. Does Your Big Apple Business Need an Excel Consultant? Our new and improved Manhattan office can help! Contact Excel Consultant today to learn more and schedule an appointment. Posted on April 6, 2018 Posted in Blog Category and tagged Microsoft Office, Professional, Video, Programming, Microsoft Office Training.